The Consul General of Estonia visited St. Petersburg, Florida, Friday and Saturday, May 24 and 25, 2013, and accepted applications for identity cards, new passports and passport renewals from those with legitimate status in the US. More than 20 families were served during this visit. This was the Consul General’s first official visit to the recently established Honorary Consulate in St. Petersburg, Florida. 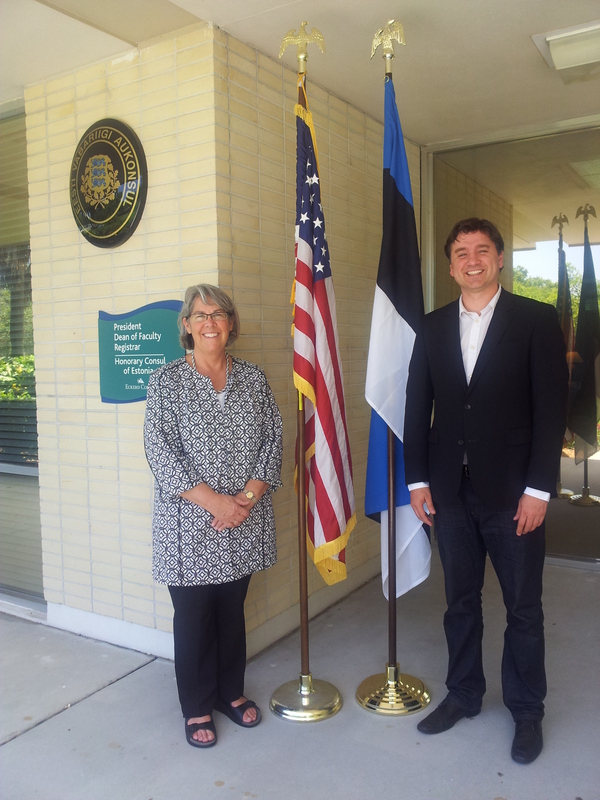 The Republic of Estonia’s Honorary Consul Lisa A. Mets and Consul General Sten Schwede, St. Petersburg, Florida, May 24, 2013. 1. Drive past the Gate House. 2. Go up and over the traffic circle to the left. 3. Follow the road to the right. 4. Park in the first parking lot on the right. 5. The Honorary Consulate is located in the one-story building (Upham Administration Building) next to the parking lot.